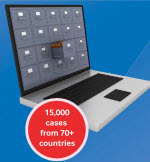 Since 2008, BMJ Case Reports has advanced evidence-based medicine by publishing 15k+ clinically-significant case reports covering rare and common conditions. Content is peer reviewed and searchable by medical specialty and discipline. Need more convincing? Read a comprehensive product review published by Doody’s in June 2018.